How about spending a Tuesday night with Wine Spectator’s number 51 wine of this year’s top 100? The best part is it’s under $20? Some of the wines on the list are priced much higher than that. This gem received 90 points and made this prestigious list. 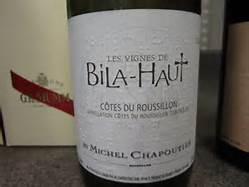 This amazing wine is Made by Michel Chapoutier, one of the world’s best winemakers, and it comes from a wonderful winery in France’s Roussillon region, just north of the border with Spain. This wine is a versatile pairing wine, but might match best with a pot roast or a nice plate of pasta, comfort food on a cold night. It displays dark cherry aromas with lots of spice from the three grapes that make up the blend, syrah, Grenache and carignan, traditional southern French grapes. Don’t save it for a special occasion, Tuesday is special enough! Cheers!